A delegation of over 20 people from Fordingbridge, visited Vimoutiers last weekend to celebrate Vimoutier’s annual “Fete de la Pomme” (annual apple festival) in order to meet visitors from two other towns that Vimoutiers is twinned with, from Belgium and Germany. Two of the delegation, Tim Wheatley and Dave Green, arrived on tandem on the Saturday morning celebrating their arrival at “Le Fordingbridge Bar”, in the middle of Vimoutiers! 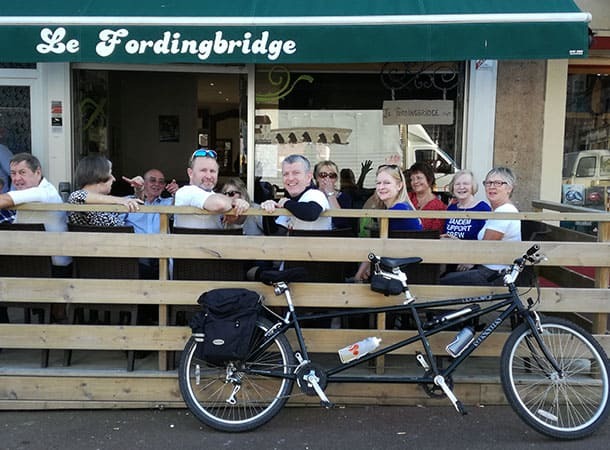 They had cycled from Le Havre to Vimoutiers to celebrate 35 years after 6 riders had done it 35 years ago, to inaugurate the beginning of the Twinning of Fordingbridge with Vimoutiers, in Normandy. In 1981, six cyclists, including Brian Wheatley, Tim’s father, (representing what was then known as “Friends of Fordingbridge”) rode from Fordingbridge to Vimoutiers on tandems, to launch the twinning between Vimoutiers and Fordingbridge. Tim and Dave were welcomed by Tim’s mother, Sue Wheatley, and various other members of the two families. A celebratory drink was enjoyed at “Le Fordingbridge Bar”, by nearly everyone: a fantastic effort!